Teaching your child boundaries, learning to say “no,” and coaching your child to practice good behaviors are all part of an important discipline strategy. Helping your child through each phase of his life with loving discipline is an integral part of his development, a necessary requirement to help him grow into a healthy adolescent and beyond. Having said that, it’s also important to acknowledge that it is almost never easy! I say this because I believe that too often parents shy away from disciplining their children because it hurts them to watch their little ones become even more upset. So the most important thing for you to do before you read any further is to acknowledge to yourself that discipline is not fun and rarely easy. However, without it your child will be at an enormous disadvantage throughout their school years and in their social life. Discipline teaches the most important values we as parents can impart to our children: self-control, boundaries, respect, and the ability to honor those around us. Children are able to understand that if you have a consequence that is not to their liking, their behavior will change pretty quickly so that they are able to join back in the fun. 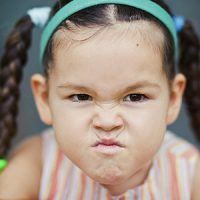 Yes, it can put a damper on your fun, but kids are smart enough to grasp the concept that naughty behavior equals serious consequences and will generally adapt to whatever expectations you have for them. And, just as adults receive positive consequences for their behavior (like getting a raise at work) there should also be positive consequences for your child, too. This is where a good behavior chart comes in handy in your home. Create any type of chart you’d like (Click here for free, downloadable charts created for Empowering Parents readers) and hang it at eye level for your child to see every day. When he succeeds at something, say not biting another child at the latest play date, he gets to put a sticker up for that day. At the end of the week after your child has earned so many stickers, he is rewarded with a bigger treat, which can range from a trip to the ice cream shop, extra video time or staying up 15 extra minutes at bedtime. For younger kids, you might start off with letting them earn a small reward each day; you can then gradually build up to longer periods of time before they earn their incentive. It is also helpful to ask your child what he would like to work towards earning; that way, you’ll also know what motivates him. 4. Manipulative Child Behavior? My Kids Are "Too Smart for Their Own Good"